Investigating the paramount issues of race, gender, and sexuality in Othello; teaching the drama as an adventure play, as a tragedy and a comedy, as an antirevenge play; assessing the complex motivations of Iago; exploring the range of actors' interpretations of Othello's character over the centuries--these are only a few of the pedagogical strategies discussed in this volume. Part 1, "Materials," is designed to help instructors manage the wealth of resources available for teaching Othello. 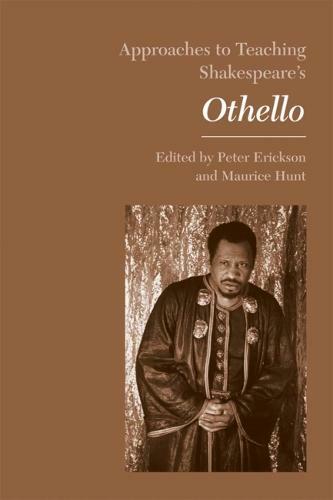 The editors carefully assess editions of Othello and of Shakespeare's collected works; review the textual history of the play; survey studies that address gender and race as historical concepts; and examine visual representations of Othello, particularly film adaptations. The essays in the second part, "Approaches," are divided into six topical sections. The first group considers race in Othello, in the Renaissance, and in the contemporary classroom. The second section addresses male desire, the fluidity of gender roles, and competing male and female fantasies. The generic forces that shape Othello are examined in the third section. The final sections explore classroom strategies, survey performances of the play, and formulate innovative ways to teach the sources and analogs of Othello.